We are currently looking for caddies for the 2019 golf season. Please view the Caddie Contract HERE. Please view the Caddie Manuel HERE. If you have not signed up yet, but are interested in caddying please fill out the Caddie Contract and bring it with you to one of the training sessions listed below. New caddies must attend three training sessions - returning caddies must attend two sessions. The first session for new caddies will be indoors, followed by a large outdoor group session and finishing with a small outdoor group training session. The art of caddying has been central to golf for almost if the game has existed. The notion of walking the fairway with someone carrying your bag, offering you insight and assistance, is an indelible part of the sport. The most famous caddies are as well known as the players—Eddie Lowery, who looped for Francis Ouimet at the 1913 U.S. Open, despite being only 11 years old, or Angelo Argea grabbing Jack Nicklaus’ bag for one of 44 wins. More recently, there’s Jim “Bones” Mackay, who has caddied for Phil Mickelson for nearly a quarter century, and Steve Williams, the notorious looper for numerous players, including Tiger Woods and Adam Scott. Caddies are an essential component of golf. And such is the case at Hamilton, where caddies have been part of the club throughout its history. And even when caddies have fallen out of fashion at most Canadian clubs—only a couple of clubs offer caddies to members and guests any longer—Hamilton has maintained a vibrant caddie program, one that is intrinsic to the club’s identity. “As far as I know caddies have been part of Hamilton for as long as the club has been in existence,” says Scott Shannon, a Hamilton member who worked as a caddie for the club. Caddies were always important at Hamilton. Agnes Climie set aside money for an award for the top caddie each year, and in 1934 the board arranged for reduced bus fares for the young loopers. The caddie program at Hamilton offers several advantages for both the course and its caddies. First and foremost, it presents an experience for the golfers in the way they interact with the caddie and how it affects their experience on the course. It also offers boys and girls an opportunity to learn the game, and at Hamilton it provides those young teenagers with access to the club’s world-class courses. That was a key factor for Brian Jacobs. He remembers coming to caddie at HGCC in 1970, hitching car rides from members to get to the club at 5:30 am, finding the rare spot open for breakfast at that point and waiting for the right golfers to approach. Michael Ecker came to Hamilton as a caddie in 1974 at the age of 11. His older brothers, Jim and David, had both worked as caddies before Michael arrived. It didn’t take him long to figure out how to fit in and find a bag. No one who played Hamilton in the late 1980s will likely forget the three Homier brothers—Karl, Marc, and Roch. They were triplets who worked as caddies over four years starting in 1987. An older brother, Eric, had already paved the way for the triplets, who weren’t identical, but could fool most people, says Karl, 42. That is a common theme—caddies with little previous golf experience would become players for life. Jacobs, who would go on to join Hamilton and become Men’s Club Captain, was a baseball player with little experience in golf when he started caddying. That changed quickly. “It was a sport and it had a ball that you could hit hard and go find,” he says, laughing. It didn’t take long for him to get hooked. “Would I have found golf had I not worked at Hamilton? That’s hard to say,” he says. That’s the key—the number of players like Shannon, Homier brothers, and Jacobs, who came to the club with limited experience with the sport, and left connected to a game that has been with them for a lifetime. Ecker says he’ll never forget the experience of playing the Colt course on Monday mornings, racing around to make sure he got all the holes in. As a caddie, Shannon had one of the more interesting experiences at the club when he was picked to work with Jack Nicklaus in 1986, the year of the Golden Bear’s final major win. The event was a Pro-Am connected to the Canadian Open. Shannon was 19 when he worked for Nicklaus, and after years of touring members around the course, he had to contend with the large crowd that came to see the golf legend play. It was a challenging day, to say the least. As times and demographic patterns change, so has the approach to the caddie program. Turf struggles in 2014 meant that not as many caddies got work at the club, something that’s impacted the program. The way Hamilton develops caddies—moving up in tiers as their experience increases— means losing a year is a significant factor. 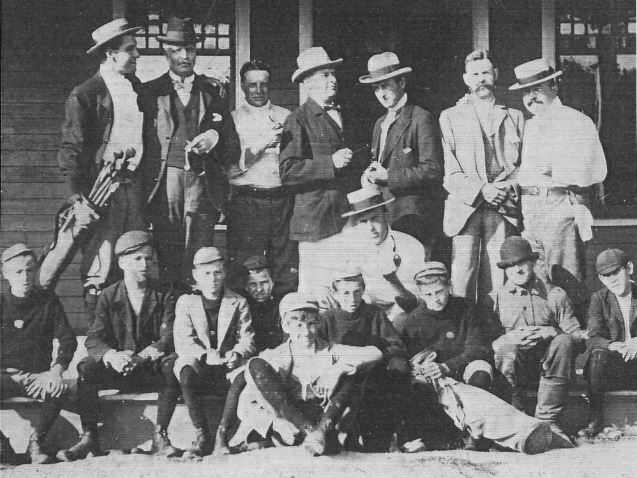 And caddies often come to the club from farther afoot, Shannon points out, making the trip to the club from the west side of Hamilton and Caledonia. Still, the best caddies work more than 100 games a year, and the caddie banquet is still an important part of the club’s culture. “I think members realize how important [the caddie program] is, and how much of history it has at the club,” says Jacobs. Ask Jacobs what role caddying at Hamilton had in his development and he pauses, but only briefly. Clearly caddying played a significant role in his connection to golf, a sport he plays to this day. And, it turns out, just how significant caddies were—and remain—at Hamilton Golf and Country Club.